A tendon is a band of tissue that connects a muscle to a bone. The Achilles tendon runs down the back of the lower leg and connects the calf muscle to the heel bone. Also called the "heel cord," the Achilles tendon facilitates walking by helping to raise the heel off the ground. 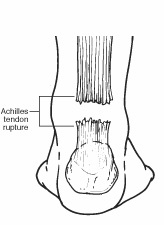 What is an Achilles Tendon Rupture? An Achilles tendon rupture is a complete or partial tear that occurs when the tendon is stretched beyond its capacity. Forceful jumping or pivoting, or sudden accelerations of running, can overstretch the tendon and cause a tear. An injury to the tendon can also result from falling or tripping. Achilles tendon ruptures are most often seen in "weekend warriors" – typically, middle-aged people participating in sports in their spare time. Less commonly, illness or medications, such as steroids or certain antibiotics, may weaken the tendon and contribute to ruptures. Rest. Stay off the injured foot and ankle, since walking can cause pain or further damage. Ice. Apply a bag of ice covered with a thin towel to reduce swelling and pain. Do not put ice directly against the skin. Compression. Wrap the foot and ankle in an elastic bandage to prevent further swelling. Elevation. Keep the leg elevated to reduce the swelling. It should be even with or slightly above heart level. In diagnosing an Achilles tendon rupture, the foot and ankle surgeon will ask questions about how and when the injury occurred and whether the patient has previously injured the tendon or experienced similar symptoms. The surgeon will examine the foot and ankle, feeling for a defect in the tendon that suggests a tear. Range of motion and muscle strength will be evaluated and compared to the uninjured foot and ankle. If the Achilles tendon is ruptured, the patient will have less strength in pushing down (as on a gas pedal) and will have difficulty rising on the toes. The diagnosis of an Achilles tendon rupture is typically straightforward and can be made through this type of examination. In some cases, however, the surgeon may order an MRI or other advanced imaging tests. 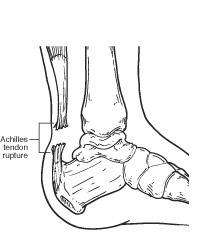 Treatment options for an Achilles tendon rupture include surgical and non-surgical approaches. The decision of whether to proceed with surgery or non-surgical treatment is based on the severity of the rupture and the patient’s health status and activity level. Non-surgical treatment, which is generally associated with a higher rate of re-rupture, is selected for minor ruptures, less active patients, and those with medical conditions that prevent them from undergoing surgery. Non-surgical treatment involves use of a cast, walking boot, or brace to restrict motion and allow the torn tendon to heal. Surgery offers important potential benefits. Besides decreasing the likelihood of re-rupturing the Achilles tendon, surgery often increases the patient’s push-off strength and improves muscle function and movement of the ankle. Various surgical techniques are available to repair the rupture. The surgeon will select the procedure best suited to the patient. Following surgery, the foot and ankle are initially immobilized in a cast or walking boot. The surgeon will determine when the patient can begin weightbearing. Complications such as incision-healing difficulties, re-rupture of the tendon, or nerve pain can arise after surgery. Whether an Achilles tendon rupture is treated surgically or non-surgically, physical therapy is an important component of the healing process. Physical therapy involves exercises that strengthen the muscles and improve the range of motion of the foot and ankle.